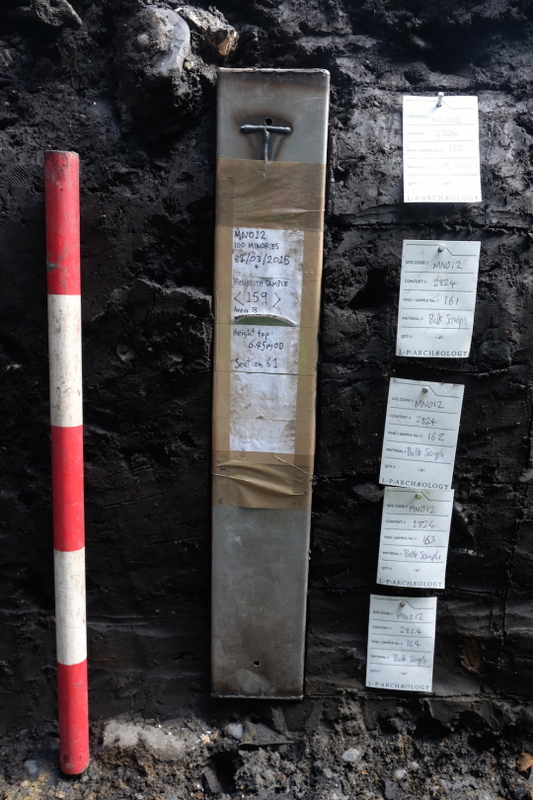 CITE AS: Flo Laino, "Photo Diary : March 2015," in 100 Minories, April 7, 2015, https://100minories.lparchaeology.com/photo-diary-march-2015/ [Date Accessed: April 23, 2019]. 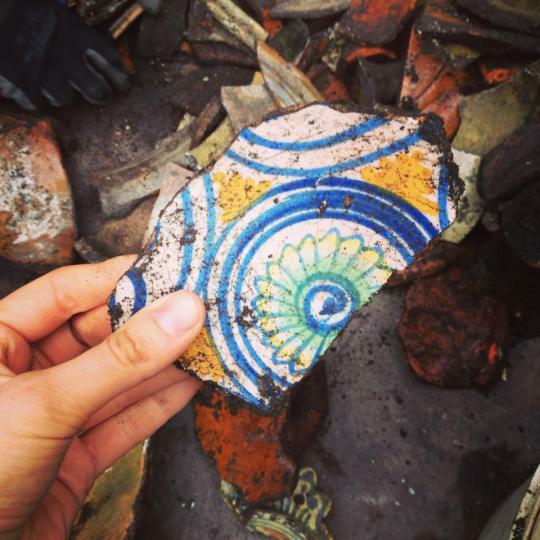 Check out what happened on the 100 Minories excavation in our latest photo diary for the month of March 2015. 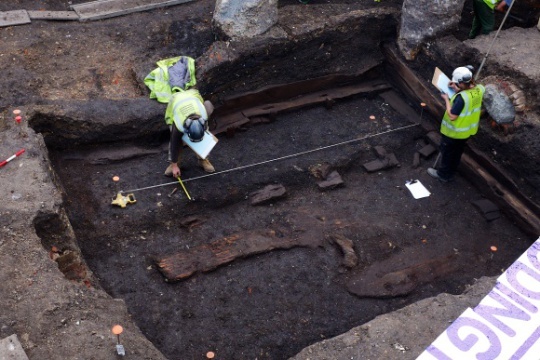 At the very end of February, some timbers of a wooden structure began to emerge, these were fully excavated in March, to reveal a 17th Century timber structure (Chiz and Ben planning and recording the base of structure). 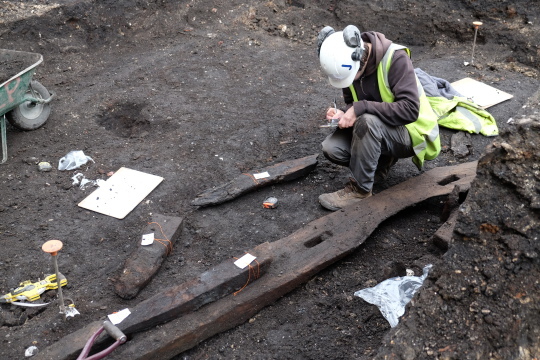 John Quarrell recording and preparing the timbers for transport to our post-excavation processing unit. 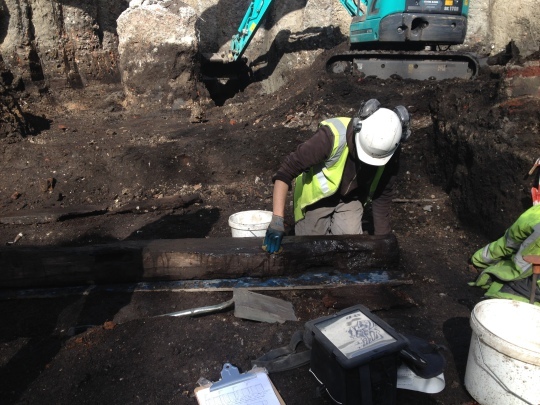 Each timber is removed, washed, recorded and wrapped in cling-film for temporary preservation. 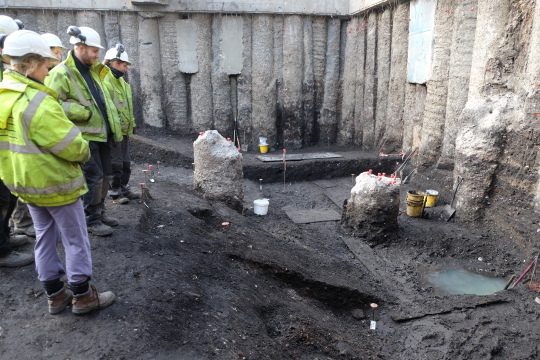 Following the removal of this structure, work began on the excavation of the latest fills of the City Ditch. 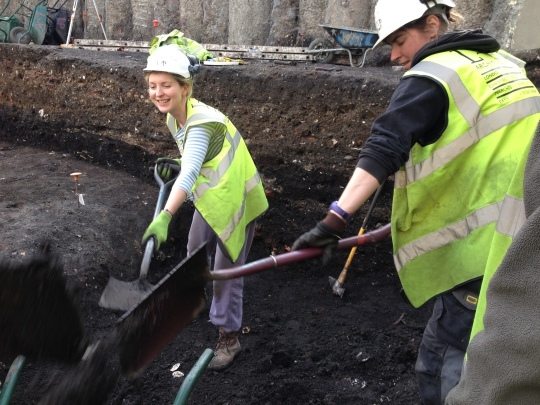 Audrey and Manca excavating fills from inside the latest cut of the City Ditch. 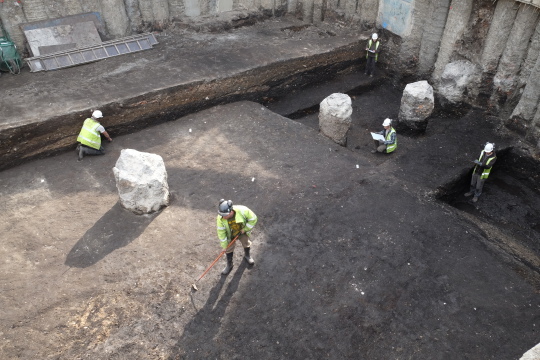 In the foreground, Chiz is hoeing and Ben is kneeling on the land surface associated with the last recut of the city ditch. In the background (right to left): John Quarrell, Tom Moore and Ashley are stood within the latest cut of the ditch itself. Later “landfill” material is seen in section (behind Ben and Ashley) overlying both the ditch fills and the land surface itself. 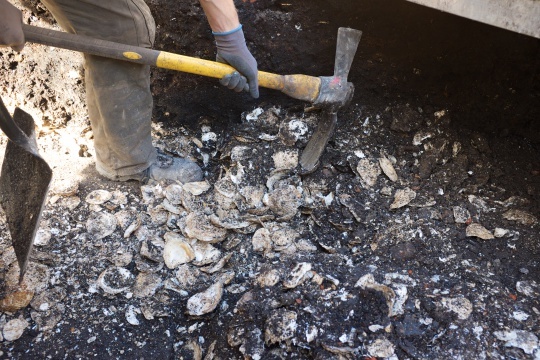 Throughout these dump deposits and fills there were several pockets of oyster shell dumps. 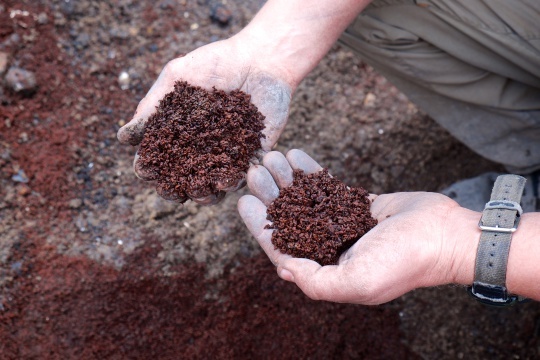 Large quantities of these small, fine, strongly-smelling seeds were also found in patches within the ditch fills. 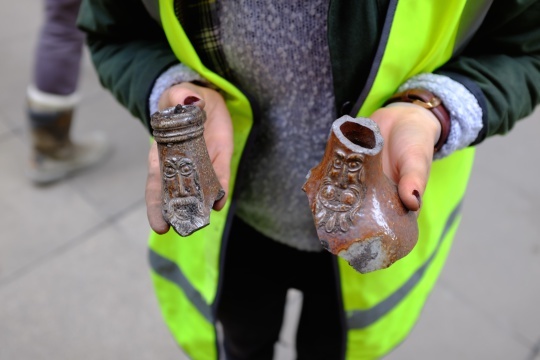 Archaeo-botanical analyses will give us insight on what these seeds are, and why they are at 100 Minories. 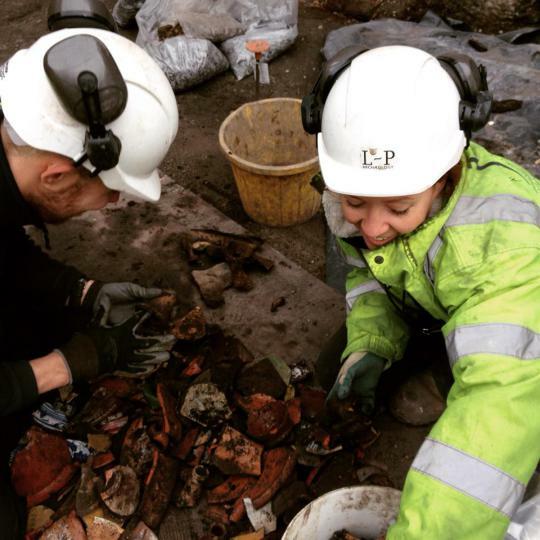 An infamous dumping ground in the City’s history, all sorts of ‘junk’ survived to be sorted sorted from the Ditch infilling phases. … as well as leather. 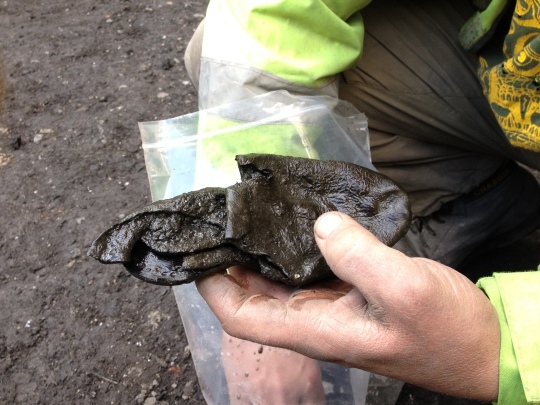 These leather children’s shoes are just one of many leather remains being recovered at Minories. 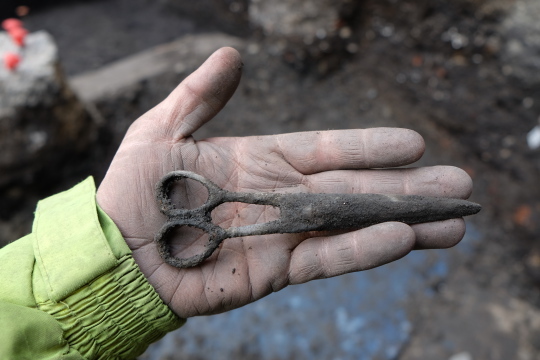 In addition to the nice profile of ‘city trash’ being uncovered through the finds, the ditch is also disclosing some other interesting features which may relate to its life and the nature of its use. 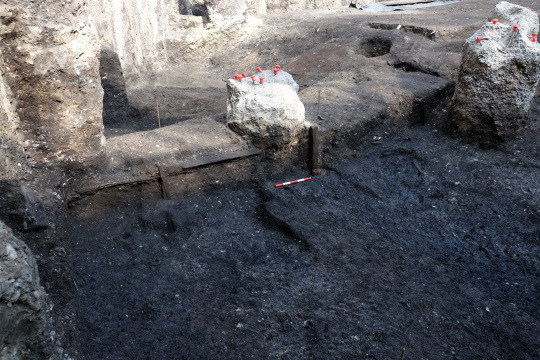 The picture here shows some form of Post-Medieval timber-reveted causeway extending out from the edge of the ditch, towards the City Wall. 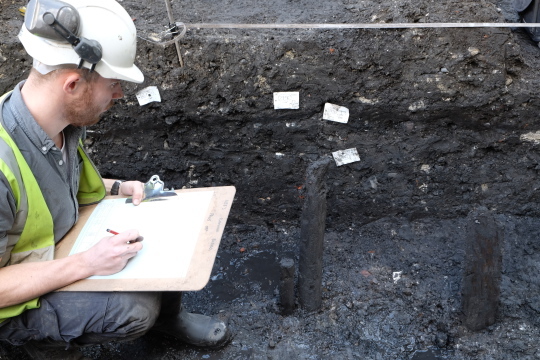 Tom Swannick recording stakes that formed part of a revetment. 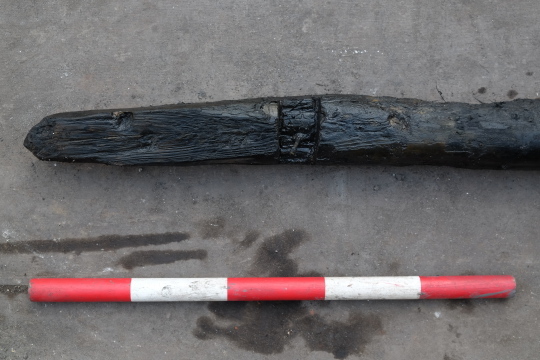 Most of the timber from the revetments constitue a low-grade quality of wood – reused off-cuts like this one. 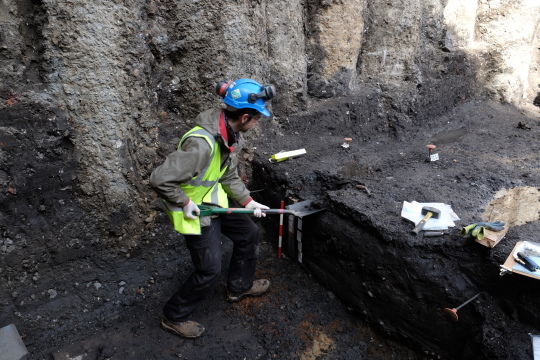 Geoarchaeology specialist Mark Ruddy, taking samples from the silt at the base of the ditch for fine-grained analysis of the soil formation. 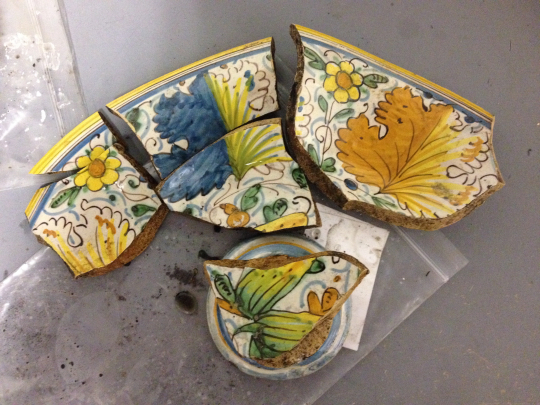 Georchaeology sampling tins – prior to removal from archaeological section.